The variety of paper-based objects that come through the Book and Paper Conservation Services studio never ceases to amaze us! This set of P. T. Barnum Circus posters circa 1883 is one of the most unique artifacts we've worked on. P. T. Barnum Circus posters displayed in the Elgin County Museum, before conservation treatment. Part of the collections of the Elgin County Museum in St. Thomas, Ontario, Canada, the posters advertise the P. T. Barnum Circus performance in St. Thomas on July 26, 1883; notably, the posters feature Jumbo the Elephant, the famed pachyderm who would later be killed after another appearance in St. Thomas in 1885. Anyone familiar with St. Thomas and Elgin County, Ontario, knows Jumbo's importance to the community. The story of the elephant's tragic death in a train collision is one of the greatest legends of the town, and features prominently in the area's tourism. Jumbo has inspired a life-sized monument on Talbot Street, a brand of craft beer, and of course a permanent collection of objects in the Elgin County Museum. P.T. Barnum Circus posters featuring Jumbo the Elephant, before conservation treatment. This set of posters was donated by a member of the community after it was found inside the structure of a building undergoing renovation in 1983; the posters were on the underside of the boards, and so were hidden until revealed by construction. 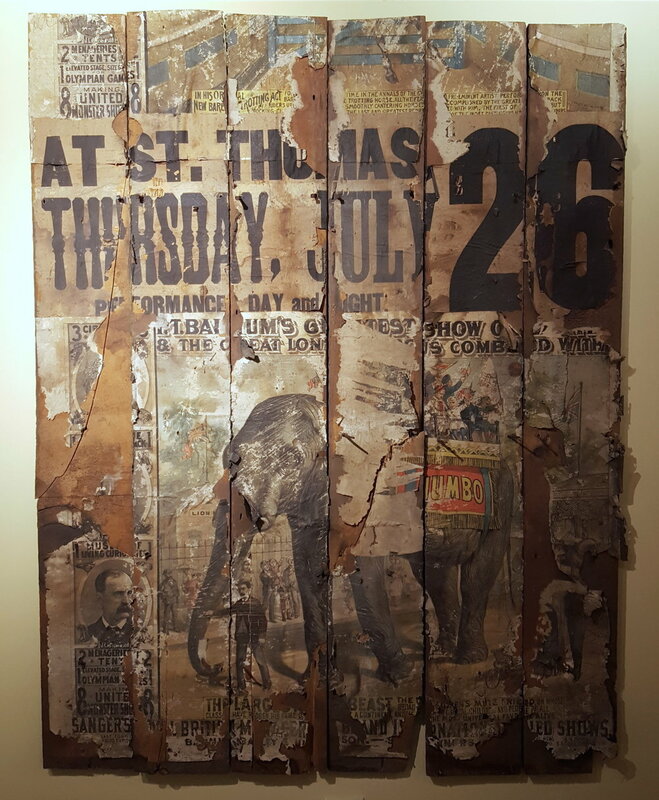 The remnants of the posters were still mounted on the boards, originally a fence or barn wall, on which they were first displayed to advertise the circus's visit. However, the fragments had suffered from the ravages of time, pests, mould and dampness since being reused in the floor of the building. Biological damage and surface mould on the delicate paper. The Museum felt that the historical integrity of the artifact was best served by keeping the poster fragments in place on the original boards, recalling the way the posters would have been viewed originally, while also acknowledging the unique circumstances of their preservation and discovery. We determined a treatment protocol that would clean and secure the delicate paper in place on the boards, as well as provide some protection from the handling and exposure that the piece will inevitably receive while on display. Surface cleaning the poster fragments. First, the paper and exposed board surfaces were gently surface cleaned to remove a thick layer of dirt, grime and biological material. The undersides of lifting paper fragments were also cleaned, where large deposits of debris had collected with time. Then, crumbling edges overhanging the edges of individual boards were reinforced with Japanese paper to provide strength and deter further damage. Protective coating applied to the delicate paper surface. The coating also serves to re-saturate the printed colours and paper tone: the top half of AT has been coated, the bottom half has not. The lifting fragments of paper were secured back down onto the boards with a strong but reversible acid-free adhesive, and the surface of the delicate paper was coated with a cellulose ether solution to strengthen and protect the delicate paper. The coating also served to re-saturate the printed colours and paper tone, bringing back more of the original vibrancy of the image. Detail of posters before conservation. Detail of posters after conservation. You can see in the after treatment details that the posters have been stabilized and rejuvenated on the boards, allowing better appreciation of their historical importance. They can now be safely handled and displayed without risking further damage to the fragile materials. The posters have been returned to the Elgin County Museum where they will be back on display shortly. As a testament to the enduring interest in Jumbo's story, two upcoming television programs will investigate the legend of the famous elephant, perhaps revealing new information about his life and death. David Suzuki's CBC program The Nature of Things will air an episode dedicated to Jumbo sometime in 2018; David Attenborough has also visited St. Thomas to research an upcoming feature about Jumbo. Visit the Elgin County Museum this fall to see the restored P. T. Barnum Circus posters featuring Jumbo the Elephant, and stay tuned for the upcoming television specials. The Museum plans to mount another exhibition on Jumbo's life and legacy in St. Thomas to coincide with the renewed interest next spring! Do you have archival materials - posters, photographs, documents, etc - that you are interested in having restored? Contact Book and Paper Conservation Services today to discuss conservation treatment of your objects, or check out our portfolio section to see other projects we've worked on.